Research undertaken by the University of Southampton and its associates in Venice has revealed that the sea surface temperature (SST) in coastal regions is rising as much as ten times faster than the global average of 0.13 degrees per decade. Researchers believe that this is partly as a result of a process known as the ‘urban heat island effect’; where regions experiencing rapid industrial and urban expansion produce vast amounts of heat, making the area warmer than its surroundings. The world’s coastal zone occupies 18 per cent of the world’s land mass and it is estimated that 1.6 billion people live in these regions world-wide. The coastal population density is three times the global average and this population is expected to increase 30 per cent by 2025, with trade and infrastructure at the coasts also increasing steadily. Research suggests that in coastal regions of high urban development, human activity is directly warming adjacent coastal waters and that this contribution to global warming at the coastal zones is equal to, or greater than, other factors such as greenhouse gasses. In Venice, with 22 million visitors annually and tourism a year-round source of income, the economy remains critically dependent on the city maintaining its status as one of the world’s most desirable destinations. 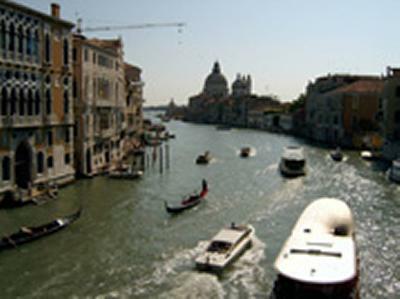 Southampton’s research in Venice has highlighted the tension between tourism’s economic benefits and environmental repercussions. Analyses of seawater temperature trends in the Venice Lagoon have suggested an increase during winter months ten times greater than that predicted globally by the IPCC – a result directly linked to tourism. Thousands of jobs and the Venetian economy rely on the survival of the fishing industry, which is dependent on the temperature of the coastal seawater in the Venice Lagoon. A rise in SST in the coastal zone reduces oxygen levels and displaces marine fish and associated nursery grounds, causing catastrophic fish kill phenomena. This research has helped predict the viability of clam fisheries and aquaculture habitats that serve the restaurant trade that caters for millions of tourists every year.